This is a rare piece of paperwork from the colonial militia in peacetime. We have good records of who served in militia companies called up for active service because the government had to pay those men. But ordinary militia training was a duty and no money exchanged hands for that labor, so there was no reason to preserve records. It’s not clear to me who created this document or why it was preserved. But it’s an interesting snapshot of administering a militia company. Joseph Jackson (1707-1790) was colonel in charge of the Boston militia regiment in the late 1760s, as well as a selectman and a justice of the peace. That regiment was organized along the British model, with one company assigned to Col. Jackson and probably led in practice by a lieutenant. The purpose of this document appears to be to list all the Boston men assigned to Jackson’s company. There were about 3,000 white males above the age of sixteen—i.e., required to do militia training—in Boston at this time, and 239 men on this list. It looks like Jackson’s men came from the wards near the center of town. There was also one “Engine Man,” John Newal. Did this mean he looked after a firefighting engine? That left 154 names under “Liable to Train”—though two were labeled “Lame,” one as at “Sea,” and a fourth as “Excd.,” suggesting he was excused. (He was a Jackson.) A couple of those men have the title “Capt.,” probably meaning they were ship’s captains. 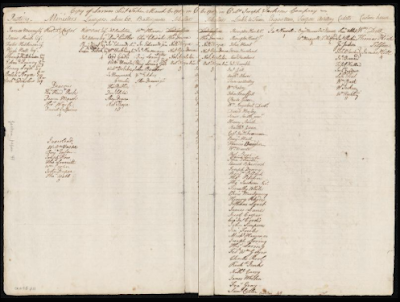 Some names already appearing among Boston 1775’s numerous tags are John Gill, Charles Conner, Thomas Waite Foster, John Piemont, Gawen Brown, and Nathaniel Barber. There are no men identifiable as black or Native American. The law excluded such men from militia training, though some nevertheless did serve when war came. There are also no identifiable Quakers. I don’t think Massachusetts had a provision for conscientious objection yet, but the concept was recognized. It might be possible to correlate this list from 1769 with the Boston tax records from 1771 and glean more information. But I’ll leave that to another day. Right now I’m feeling too inverlead.